Elderberries - Recipes, Nutritional Information, Home Canning and Freezing Instructions! Looking for Elderberries - Recipes, Nutritional Information, Home Canning and Freezing Instructions! in 2019? Scroll down this page and follow the links. And if you bring home some fruit or vegetables and want to can, freeze, make jam, salsa or pickles, see this page for simple, reliable, illustrated canning, freezing or preserving directions. There are plenty of other related resources, click on the resources dropdown above. Elderberries and a unique American fruit, familiar to native Americans, but still not commonly known by many others. Ripe elderberries yield an abundance of sweet juice that is used for jelly, jam, juice, elderberry wine and syrups. They can be cooked into a rich sauce that needs no sweetening. The whole berries are very tart and seedy, but still make excellent pies. Elderberries usually ripen throughout the months of August to October, depending upon the weather and area of the country. 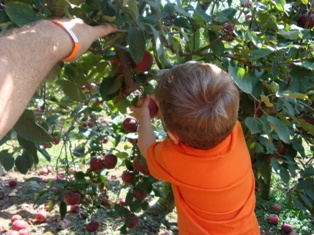 The clusters of berries are gathered in large quantities. We will only use the dark purple berries (read below). There are seven native species, two of which are shrub-like (small tree) and found in eastern North America, the others spread across the west. Utah State University tells us that "native Americans had a use for almost all parts of this plant; berries for food (fresh or dried); stems for tubes, pipes and musical instruments. The USDA says "Only the blue or purple berries of elderberry are edible. The active alkaloids in elderberry plants are hydrocyanic acid and sambucine. Both alkaloids will cause nausea so care should be observed with this plant. 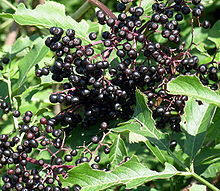 Elderberries are high in Vitamin C. The red berries of other species are toxic and should not be gathered". Cornell University reminds us that "Uncooked berries have a dark purple juice and are astringent and inedible". Some Indians called this plant "the tree of music," since the smaller twigs and limbs made excellent flutes. Strips from larger limbs made arrow shafts. Flowers were used for external antiseptic washes." Smaller amounts of calcium, iron, phosphorus and the B Vitamins. Wash the elderberries in a colander under cold running water, removing any mushy or spoiled berries. Allow the water to drain off for a few minutes. Dry pack, with no added sugar. Pack the berries into freezer containers, such as ziploc bags, then exclude as much air as you can (Vacuum sealers work great) then seal and freeze. This method works best when you plan to later use the berries in cooked dishes and pies. Wet pack, in a sugar syrup. Make a medium sugar syrup by dissolving 3 cups of sugar in 4 cups of warm water, to yield 51/2 cups of syrup. Chill in the fridge for a couple of hours before using. Pack the berries into freezer containers, such as ziploc bags, then cover them with the syrup. Exclude as much air as you can (Vacuum sealers work great, after you freeze the bags first, then vacuum seal them in a frozen state) then seal and freeze.